For a great tasting, delicious shake combine 3 scoops of INCREDIBULK™ with 16-20 ounces of cold water (depending on personal preference for desired thickness). Use 2-3 servings daily for maximum protein uptake. Always drink 12 to 16 ounces of additional water for each protein shake consumed. Maltodextrin, Whey Protein Concentrate, Milk Protein Isolate, Cookie Crumbs (Rice Flour, Sugar, Tapioca Starch, Palm Oil, Cocoa Processed With Alkali, Corn Starch, Salt, Chocolate Liquor, Natural Flavour, Sodium Bicarbonate, Soy Lecithin), Natural and Artificial Flavours, Soy Lecithin, Xanthan Gum, Guar Gum, Salt, Sucralose, Acesulfame Potassium, Conjugated Linoleic Acid 60%, MCT Powder (Medium Chain Triglycerides (from Coconut), Non-fat Dry Milk, Disodium Phosphate, Silicon Dioxide). Maltodextrin, Whey Protein Concentrate, Milk Protein Isolate, Natural and Artificial Flavours, Soy Lecithin, Xanthan Gum, Guar Gum, Salt, Sucralose, Acesulfame Potassium, Conjugated Linoleic Acid 60%, MCT Powder (Medium Chain Triglycerides (from Coconut), Non-fat Dry Milk, Disodium Phosphate, Silicon Dioxide). Contains milk and soy (as soy lecithin). Contains NO soy protein. Produced in a facility that processes milk, egg, soy, wheat, tree nuts, and peanut. Maltodextrin, Protein Matrix [Whey Protein Isolate, Whey Protein Concentrate], Fructose, Natural and Artificial Flavor, Soluble Corn Fiber, Corn Starch, Sunflower Oil, Sodium Chloride, Corn Syrup Solids, Guar Gum, Xantham Gum, Sucralose, Acesulfame K, Sodium Caseinate, Monoglycerides, Diglycerides, Dipotassium Phosphate, L-Leucine, L-Isoleucine, L-Valine, L-Glutamine, Tricalcium Phosphate, Soy Lecithin, Tocopherols. The fact of the matter is, if you’re looking to add quality lean muscle mass, you need to fuel the growth with quality calories. It takes 3,500 calories a week above your maintenance level in order to gain just one pound and for many, aside from the gym, this is the hardest part of their fitness goals. This can be accomplished from a combination of whole foods and supplemental calories...IncrediBULK was created specifically for this purpose, packing 1,250 calories per serving to get the needle moving in the right direction for your mass gaining goals. The other thing to remember is that quality also matters when it comes to your calories. 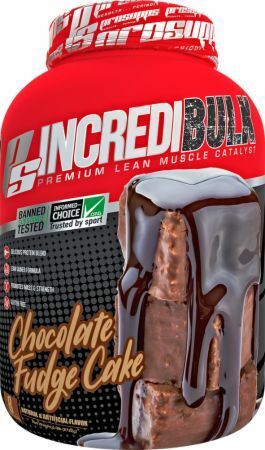 IncrediBULK was formulated starting with high biological value proteins that are easy to digest, provide a full spectrum of amino acids and support lean muscle growth and maintenance. Providing 50g of premium protein per serving, IncrediBULK has the protein you need to fuel recovery, lean muscle mass growth and quality weight gain. While protein is often thought of as king, calories don’t end with just protein. IncrediBULK has over 250g of quality carbohydrates per serving. Carbohydrates provide a sustained energy source for fueling training, recovery and growth and prevent protein from being used as fuel instead of building muscle.